Get answers to some of our most frequently asked questions about our services. If you have a question that you don't see here, please feel free to contact us! At what height should I mow at? Always mow high at 3" or more, especially when it is dry. Only the last mowing of the season should be short. 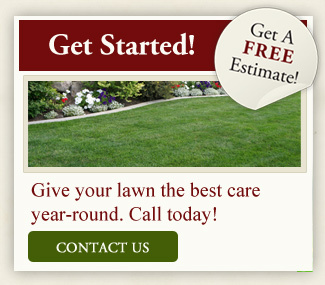 Prevention is the best route with maintaining a healthy, thick lawn. Not mowing too short also helps because the crabgrass needs sun to reach the soil to take root. Wind-blown seeds will come into your lawn no matter what. Applying a pre-emergent in the spring will stop the germination of seeds on the lawn. Crabgrass loves hot, dry weather also. It thrives next to driveways and sidewalks in July weather. We also have a chemical to hand spray some of these small areas when the pop up. How long does it take for weeds to die-off after applying weed control? Broadleaf weeds will begin to wither and curl-up within 3 to 7 days of treatment. How long should I wait to mow after a weed control is applied? The application should stay on your lawn for at least 24 hours to let the weed plants absorb the product. Should I bag lawn clippings when I mow? Leaving clippings on the grass adds moisture to your lawn and can add nutrients. It is really only recommended when the grass is very long and would leave too much dead grass on the lawn. An aerating machine actually pulls out plugs of thatch and soil. This helps loosen up compacted soil from heavily used lawns or lawns mostly composed of clay soils. It gets air, water and nutrients near the roots. It is also a good idea to seed after aerating as the soil is exposed. What time of the year is best for seeding and overseeding? The best time is in the fall around the beginning of September. This is due to mild temperatures and adequate moisture. Mid-May would be the next best time. The optimal time is in the morning. There is too much evaporation in the afternoon and too much water after dark can lead to mold and diseases. Why do I get dandelions every year and how can I get rid of them? Broadleaf weeds can only be treated when they are already growing. The herbicides have to stay on the plant to effectively "kill" them. Treatments should be applied throughout the season and especially into the fall to prevent them from coming up the next spring. Mowing higher and watering at 1" per week will keep your grass thick and healthy, therefore not leaving room for germinating dandelions.